Good morning! My card for today feels perfect. Giving thanks... I am so thankful to be home with my family, soaking up the mountain air. I am thankful for toffee from Cathy's Candy. I am thankful for home-cooked meals. I am thankful for the cool breeze. I am thankful that I get to see some old friends in just a few days. So much to be thankful for! I finished this card before I left town earlier this week, but saved it until now to post. Nothing like submitting at the last moment! 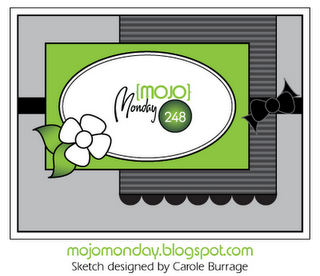 I used this week's Mojo Monday sketch, which, admittedly, had me thinking for a while. The sketch just felt lopsided to me... It needed something in that bottom left corner to ground it, in my opinion. And that's what got me thinking about this dp in particular. I love the flowers over the newsprint! It was perfect! I added a little flower from Grateful Elegance (it only felt appropriate. I mean it is named Grateful Elegance, after all.) by stamping directly onto Ocean Tides cardstock and adding some highlights with a copic marker. Oh, and a little copic-colored jewel in the middle finished it off. 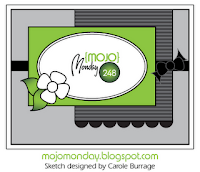 this is awesome, I adore the colors, so glad you played along with Mojo Monday...have a great week!